Kids came from school at 3:30PM wanted something special and different from routine. Mom wants to give them something healthy. Both came to an understanding, mom wants to give them different and kids agreed upon having heathy snacks. So here came methi thepla, a Gujarati delicacy. Every time I go to buy monthly grocery, make it point to buy theplas from the store. I like to give them a trial at home, but did not get a chance of making them. At last one day, I got the chance of making them as my kids wanted something different and should present them in style. I rolled them and gave it to them to have as an evening snack. Kids like it very much, I too liked them. Earlier, once I tried lauki theplas and jowar theplas they also really yummy. 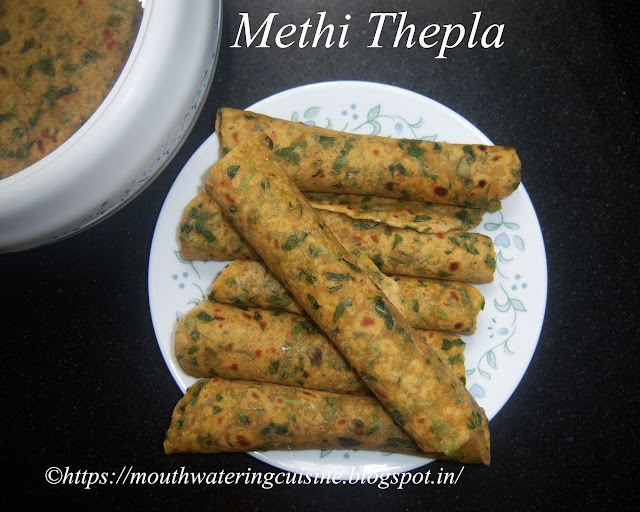 Methi Thepla are flat bread made from mix of flours and fresh fenugreek leaves with added spices. They can be consumed any time like evening snacks, during breakfast or in dinner. Serve them with yogurt or any pickle, but my people like it with achar or even plain. 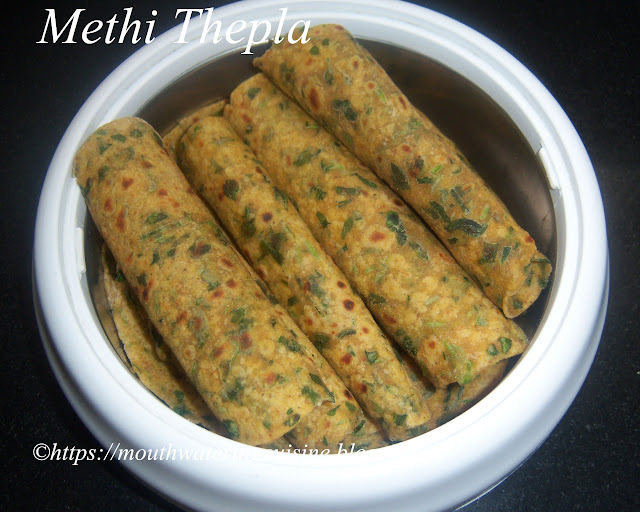 Methi Thapla -- made with fresh fenugreek leaves and added spices. Discard methi leaves from stems. Wash and chop them. In a wide mixing bowl add whole wheat flour, gram flour, salt, red chhilli powder, garam masal and coriander powder together. Add methi leaves to it and mix well. Add curd and make a smooth dough. Add water if necessary only. Make equal portions of the dough into lemon sized balls. Roll each ball using a rolling pin into round discs of desired size. Heat roti pan, place the thepla and cook on medium flame. When it formed light brown dots on one side, flip it and add a spoonful of oil. While flipping and pressing with a spatula for two to three times. Cook till golden spots appear all over the thepla and cooked evenly. Serve hot theplas with curd or any pickle. For more breads click here.Thank you for visiting my blog. Hope you liked all my recipes. Any feedback and comments are appreciated.